Souvenir buildings have long served duel purposes, but a measuring ruler is one of the more unusual. 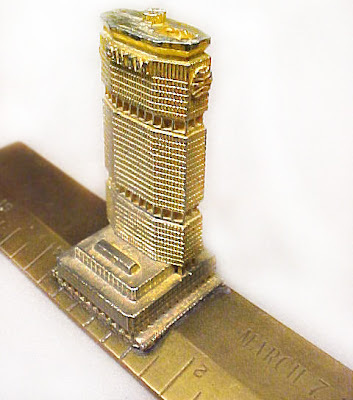 Recently, I saw up for auction on eBay, a Ford Pavilion (Ford Motor Co.) from the 1934 Chicago Worlds Fair depicted on a metal ruler. The rare, multi-color painted metal ruler was 12 inches long and sold for $452. 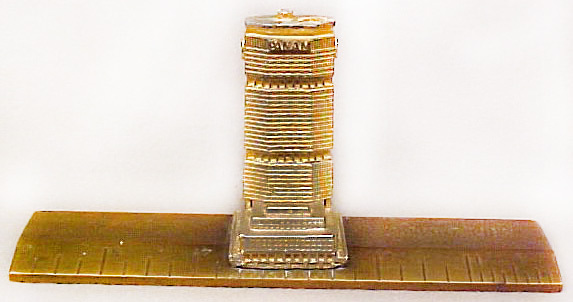 The Pan AM building was also represented atop a ruler. The 2.5 inch high metal Pan Am Building is mounted on a 6-inch solid brass ruler is a souvenir from opening day of the NYC building. The words, “March 7, 1963,” are engraved on the ruler. One recently sold on eBay for $172.50 and another for $140.50.